F. Brunelleschi L. Da Vinci Institute of Frosinone inaugurated a new a new computer lab thanks to contribution offered by Fondazione Roma on the 4th of October. An important meeting took place on the 4th of October at the F. Brunelleschi L. Da Vinci Institute of Frosinone. Thanks to the generous contribution offered by Fondazione Roma, a new computer lab with the most updated devices was inaugurated. 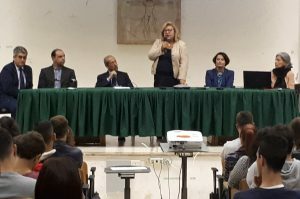 The event was attended by the Prefect of Frosinone, Mrs Emilia Zarrilli, the Provincial School Manager, Mr Pierino Malandrucco, the Principal of the Institute, Mrs Patrizia Carfagna and the President of the School Council. During the conference, the Prefect has underlined the central role of the school in the shaping of a civic consciousness for tomorrow’s citizens, stressing the importance of the students’ sense of belonging not only to their own nation, but also the need for their active part in society. Nowadays young people are lucky enough to have the same educational opportunities as public schools are able to ensure the achievement of the best educational goals. In this context, the new multimedia lab, equipped with the latest technologies, is highly significant as the “Brunelleschi Da Vinci “offers its students the utmost opportunities in order to make them highly competitive on the labor market. An important national research carried out by the “Agnelli Foundation” has placed IIS Brunelleschi Da Vinci at the top rank among the technical institutes of the Province of Frosinone, both for the quality levels of learning and training achieved by the students and for the greater number of working opportunities they have achieved after their high school graduation. The manager has highlighted the innovative value of the Institute’s training offering, oriented to the internationalization of the pathways, to the centrality of the work-school alternation, to the achievement of excellence over the county. Future implementation of exchange and internship projects with European countries, where a large number of pupils can participate free of charge and the ambitious project of cooperation with institutions and economic realities in China are important goals the school is carring out at present. It has to be remembered that the Institute has been a member of EFVET for years and over the years it has been able to plan and carry out both Erasmus students’ projects and job shadowing activities for teachers. The event was attended not only by students gathered in the conference hall of the school, but by a large crowd of people too, as direct streaming of videoconferencing was activated. The event was widely written about in the local newspapers and broadcasted on television.